Here's a link to a short piece I wrote on the genesis of the whole Poseidon's Children sequence. 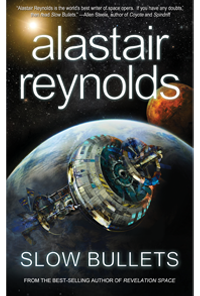 With a new book due out at the end of the month, I ought to mention that I'll be signing Poseidon's Wake at Forbidden Planet, London, on the evening of April 30th. Different people have different "rules" regarding signings. Generally the shop would like you to buy at least a new copy of the book, but I'm very happy to sign older editions if people bring them along. For the sake of the people waiting in line, I'll gladly sign three items at a time, but if you have more - and the line is still behind you - it might be an idea to go around more than once. I'll have to shoot off fairly promptly at 7.00, unfortunately, but while I'm in the shop I'm more than happy to chat, so don't hesitate to come along and ask me stuff. Two hundred years after the fall of Mechanism, human society has achieved a kind of stability. There are colonies beneath the oceans, throughout the solar system, and beyond: on the worlds of extrasolar systems. Vast hemirelativistic ships connect these colonies, travelling at half the speed of light. Or rather they would, if the ominous presence of the alien Watchkeepers had not led to an enforced moratorium on interstellar travel. It’s origin is unpopulated, unexplored space. No one could be there – at least, not if they travelled using human technology – so who could have sent it? How did they get there? And what use do they have for the disgraced scientist Ndege Akinya? Finding the answers will require one of the greatest expeditions humankind has ever launched, a journey further than ever attempted before, conducted under the implacable scrutiny of the Watchkeepers. But as a mission is prepared on Crucible, it turns out they weren’t the only ones to see the message – or its potential . . .
Actually, due to one of those inevitable snafus, the wrong version of the flap text ended up on the final copies, mispelling Ndegi's name and mentioning such things as faster than light travel which never had any place in the intended text. These things happen, and the correct text will be substituted at the first opportunity. For my own part, I also managed to make an error in transcribing the epigraph, which will also be amended in future editions, although I don't think that error will be at all obvious to anyone not familiar with the original Edward Thomas poem. Slow Bullets, my other book this year, will appear in June, but advanced word is already out and I've been blessed with some very kind comments from my peers. If you're in the area tomorrow, why not pop along to the Edinburgh Science Festival? 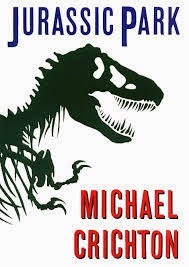 In company with Doctor Stephen Brusatte, I'll be talking about the science - good and bad - in Michael Crichton's novel Jurassic Park.